While not technically a single family residence, this unusual Piano and Violin shaped building built in 2007 serves as showroom for exhibiting the plans of the district of Shannan in Huainan City, China. 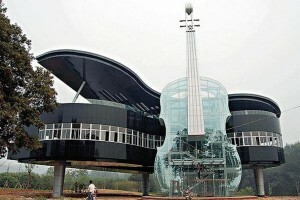 The transparent Violin houses the escalators and the staircase for the main piano building which displays various plans and development prospects for the area. It’s also a place where music students from the local college can practice and perform. What do you think? Could you see a Piano House in Nashville?